It’s still the Pacific Northwest, but look for powder snow and shorter lift lines. 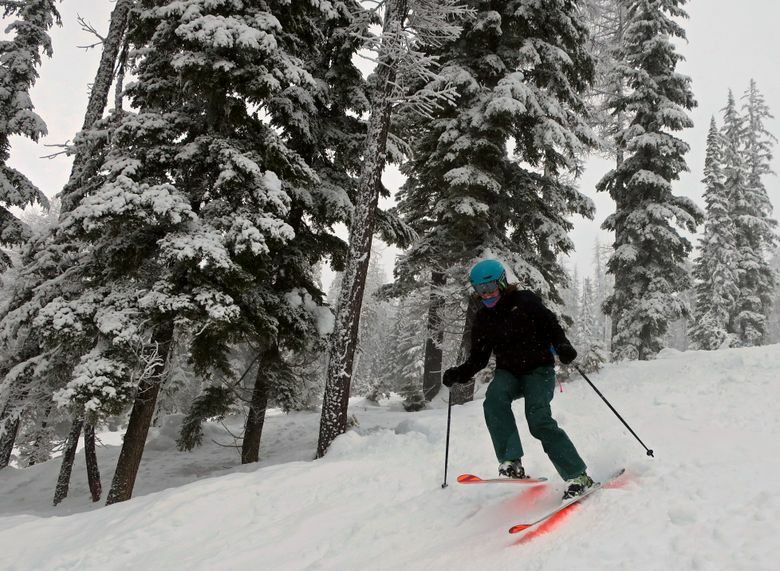 The Idaho Panhandle is in the Pacific Northwest, but it feels like another world for skiers. The snow is lighter, the crowds are thinner. You have the mom-and-pop resort of Lookout Pass, with its friendly vibe and big powder dumps. You have the reinvented playground of Silver Mountain. 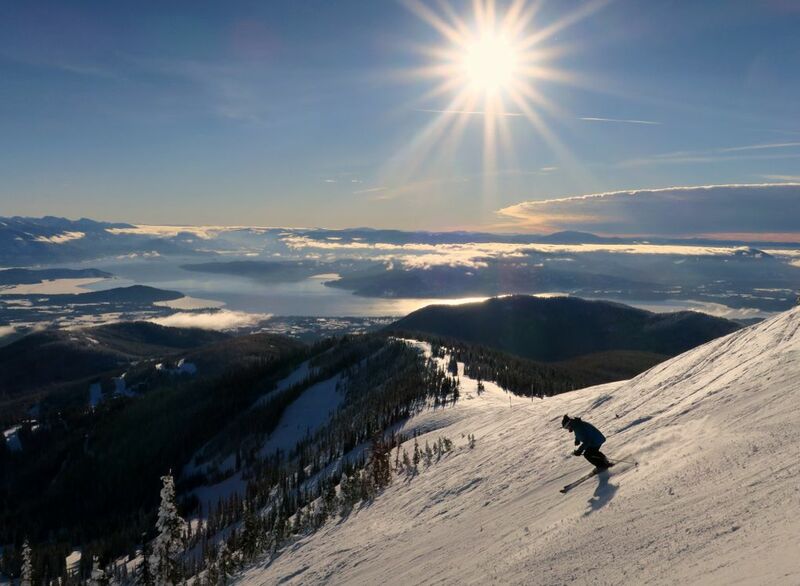 And you have one of the region’s best destination-ski resorts in Schweitzer Mountain. What are the best runs at these Gem State gems? Gear up, click in and read on. About 12 miles north of Sandpoint, Schweitzer has it all. 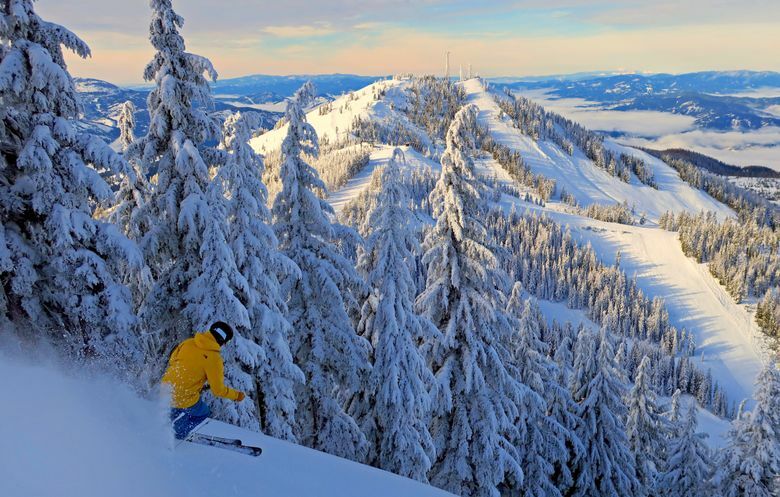 It is Idaho’s biggest ski area, with 2,900 acres of terrain spread over two large bowls. That’s right, Sun Valley, your 2,054 acres are No. 2 to this North Idaho powerhouse. Beyond the skiing, Schweitzer has a large village with restaurants and one of North America’s best mountaintop lodges with the recent addition of the stunning Sky House, with 360-degree views of the surrounding Selkirk Mountains and scenic Lake Pend Oreille far below. Best intermediate runs: You’ll find much of Schweitzer’s best intermediate runs off Stella, a high-speed, six-person lift on the back side, also known as the Outback Bowl. Zip Down and Springboard are two cruisers that deliver fast turns and often excellent snow quality. On the front side, Ridge Run also is an exceptional cruiser. Best advanced runs: Schweitzer excels here. On the front side, head for the Lakeview Triple, which delivers skiers to Schweitzer’s high point at 6,389 feet. The short chair offers quick, steep runs, allowing skiers to do laps while staying high on the mountain. But that’s just half the advanced-skiing story at Schweitzer. The back side has some of the most scenic cliffy drops anywhere with its Lakeside Chutes. And to the north along the ridgeline, Kohli’s Big Timber and Pucci’s Chute are classic north-facing double-diamond drops. Best powder runs: Schweitzer’s gladed and treed terrain is particularly good for powder skiers. Among the best places to hunt for fluffy white stuff is off the Idyle Our T-bar on the North Ridge. Advice for first-timers: For overnight on-mountain guests, Schweitzer’s Dig Chrismer recommends a free “quick tips” tour with a resort employee. “That is a great opportunity to get a full tour of the mountain to see where everything is,” she said. Hop aboard the longest gondola in North America in Kellogg, and ride 3.1 miles into a mountain world that feels far removed from the Silver Valley’s historic mining operations 3,000 vertical feet below. 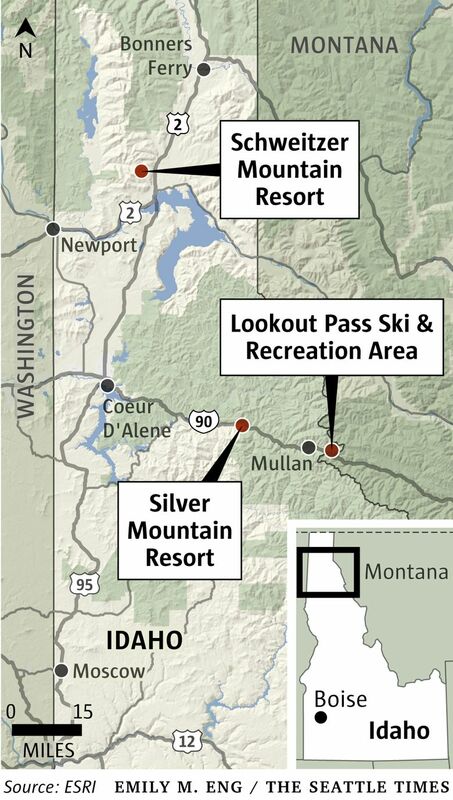 New ownership (Kenmore’s Tryg Fortun bought the resort in 2016) has injected a sense of promise into Silver, which has 2,200 feet of vertical and 1,600 acres spread off two peaks. Best intermediate runs: Start on Chair 2 and head to the top of Kellogg Peak (6,300 feet), Silver’s high point. Two of the resort’s best intermediate runs are here: Sunrise and Silver Bell. “Silver Bell is our classic warm-up run,” said Willy Bartlett, resort-marketing coordinator. Best advanced runs: Silver has some fantastic steep skiing. Two short, south-facing runs that soften up on sunny days are next to the Mountain House gondola station near Chair 1: Happy Jack and Gem. Rendezvous, Sunset and Shady Lady drop off Chair 2. Shaft delivers steep turns under Chair 4. A hidden gem, not often hit by skiers, is Terrible Edith, below the Mountain House. Best powder runs: One of the finest powder runs you’ll find anywhere is the North Face Glades. “They tend to wind-load really well during a storm,” Bartlett said. For the best experience, take a 2-minute climb off Chair 2 to the top of Kellogg Peak, where you’ll see a historic fire lookout, and drop in to the north. The steep, treed pitch offers great turns and deep snow. The resort’s other powder destination is Wardner Peak, a 15-minute climb off Chair 4 to an antenna-topped peak at 6,200 feet. Advice for first-timers: Because Silver’s runs fall off two peaks, riders will find a variety of slope aspects. “You should sample all of the different aspects to discover where the best snow is,” Bartlett said. Perched on the Idaho-Montana divide of the Bitterroot Mountains, Lookout Pass is known for great snow. “The storms get trapped here when they come through,” said Matthew Sawyer of Lookout Pass. 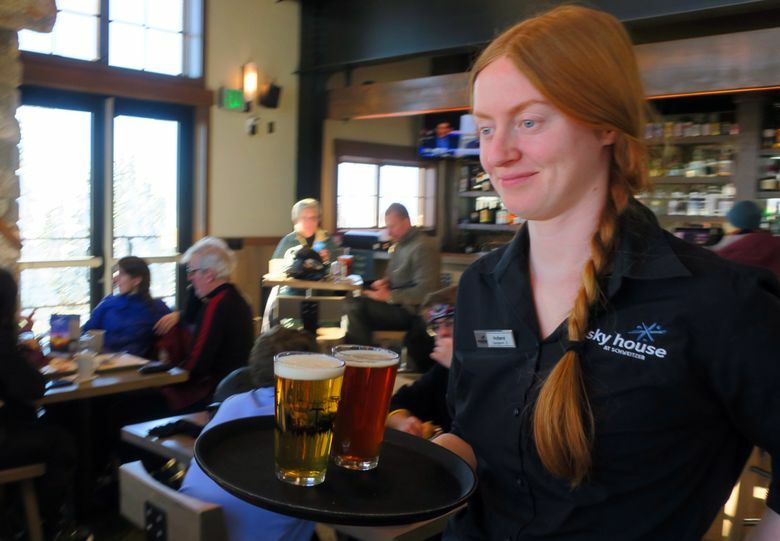 It’s often a little colder at Lookout, Sawyer said, and that translates to a “good quality light snowpack.” The small resort has a friendly feel, with a historic lodge and value-priced tickets, but it offers plenty of challenging terrain on its 540 acres. Best beginner run: Lookout is the best resort in North Idaho for beginning skiers. “We’re a family resort,” Sawyer said. “This is where people learn to ski.” In fact, Lookout has provided free ski lessons to area children ages 6 to 17 for 77 years. 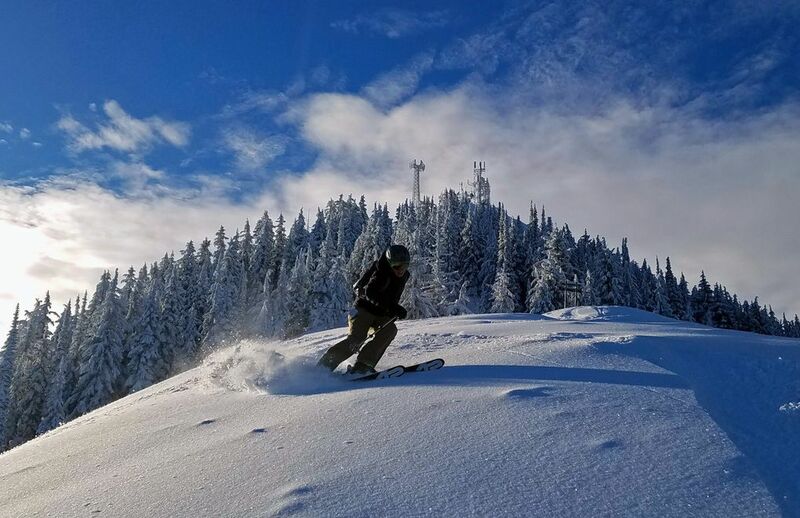 The resort has one of the best long beginner runs anywhere: The new Tamarack Trail winds a mile toward the resort’s planned Eagle Peak expansion that will take place in the 2019-20 season. Best intermediate runs: After unloading on Chair 1, Sawyer turned east and shouted over his shoulder, “We’re now skiing in Montana.” Lookout is indeed perched on the state line. Chair 2 is mostly in Montana, and Chairs 1 and 3 are in Idaho. Best Montana cruisers: Keystone and Cloud 9 off Chair 2. Best Idaho cruisers: Golden Eagle, Black Bear, Gold and Silver on Chair 1, and Marmot on Chair 3. Best advanced runs: Great steeps and tree skiing are found off Chair 1 in the Lucky Friday Glades. Off Chair 3, Hercules delivers a consistently steep pitch. Advice for first-timers: Everything leads off Chair 1, so start there. Often, the best snow is on the Montana side (Chair 2) and the best steep skiing is on Chair 3. • Lookout Pass: Some of the cheapest lift rates in the Pacific Northwest. Adults (18-61): $42 weekdays, $45 weekends and holidays. • Silver Mountain: Adults (18-61), $56; $61 on holidays. • Lookout Pass: The nearby towns of Mullan and Wallace offer some exceptional deals. For information: skilookout.com/lodging. • Schweitzer: On-mountain lodging deals are at schweitzer.com/vacation-packages.